1. What is the main idea of Robert Ariail’s cartoon? CHALLENGE: Make a list of at least 5 other companies Amazon owns that you are familiar with. 1. 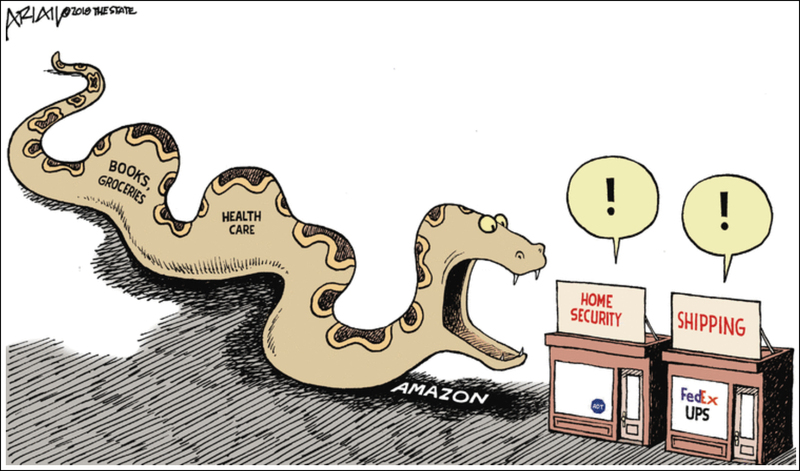 The main idea of Robert Ariail’s cartoon: Amazon is like a snake that kills/eats every business in its path. The company either buys or launches a competing service that puts the competitors out of business mostly by undercutting them on price. Soon there will be no business left but Amazon – one huge monopoly. Recently moved on to grocery stores. First by opening its own Amazon Go cashier-less store – then buying Whole Foods supermarket chain. Next, recently announcing it is developing their own employee healthcare company. And in a challenge to pharmacies (CVS, Walgreens etc.) Amazon has quietly launched an exclusive line of over-the-counter health products. Amazon said to launch its own delivery service to compete with UPS and FedEx – Called “Shipping with Amazon” – they will pick up packages from businesses and deliver them to customers. Amazon is planning to undercut UPS and FedEx on price. 3. Jeff Bezos bought The Washington Post in 2013 for $250 million in cash.